A vision of Christ amid the seven golden candlesticks! 11 Saying, I am Alpha and Omega, the first and the last: and, What thou seest, write in a book, and send [it] unto the seven churches which are in Asia; unto Ephesus, and unto Smyrna, and unto Pergamos, and unto Thyatira, and unto Sardis, and unto Philadelphia, and unto Laodicea . 13 And in the midst of the seven candlesticks [one] like unto the Son of man, clothed with a garment down to the foot, and girt about the paps with a golden girdle . 15 And his feet like unto fine brass, as if they burned in a furnace; and his voice as the sound of many waters . In this study, the apostle John first writes, I was in the Spirit on the Lord's day, and heard behind me a great voice, as of a trumpet, saying, I am Alpha and Omega, the first and the last: and, what you see, write in a book, and send it unto the seven churches which are in Asia, and then the names of the seven churches are listed. What does John mean that he was in the Spirit on the Lord's day? And, whose voice is it that John heard behind himself? And, what does I am Alpha and Omega, the first and the last mean? And, what do the seven churches symbolize? Then, John writes, And I turned to see the voice that spoke with me. And being turned, I saw seven golden candlesticks; and in the midst of the seven candlesticks [one] like unto the son of man, clothed with a garment down to the foot, and girt about the paps with a golden girdle. What do the seven golden candlesticks symbolize? And, why is Christ here portrayed wearing a garment down to the foot and a golden girdle? Finally, John says in his vision that Christ's head and [his] hairs were white like wool, as white as snow; and His eyes were as a flame of fire; and His feet like unto fine brass, as if they burned in a furnace; and His voice as the sound of many waters. What do all these things symbolize? These questions and more will be answered in this study. May our Lord Jesus Christ grant us hearts and minds to hear all that these verses have to offer, amen. 10 I was in the Spirit on the Lord's day, and heard behind me a great voice, as of a trumpet . . .
Ro 8:9 But ye are not in the flesh, but in the Spirit, if so be that the Spirit of God dwell in you. Now if any man have not the Spirit of Christ, he is none of his . So, by John saying that he was in the Spirit means, first, that the Spirit of God dwelt in him, and that he belonged to Jesus Christ, but, second, that he was in the Spirit means that he was in a spiritual state capable of receiving and obeying the revelation of Jesus Christ. Isa 13:6 Howl ye; for the day of the LORD [literally, the day of Yahweh] is at hand; it shall come as a destruction from the Almighty . Isa 13:9 Behold, the day of the LORD [literally, the day of Yahweh] cometh, cruel both with wrath and fierce anger, to lay the land desolate: and he shall destroy the sinners thereof out of it . Joe 1:15 Alas for the day! for the day of the LORD [literally, the day of Yahweh] is at hand, and as a destruction from the Almighty shall it come . Am 5:20 Shall not the day of the LORD [the day of Yahweh] be darkness, and not light? even very dark, and no brightness in it ? 2Pe 3:10 But the day of the Lord will come as a thief in the night; in the which the heavens shall pass away with a great noise, and the elements shall melt with fervent heat, the earth also and the works that are therein shall be burned up . So, in the light of verses such as these, we see that the Lord's day is the day of God's wrath or judgment, and, therefore, when our verse says that John was in the Spirit on the Lord's day, it is telling us that he was in the Spirit on the Lord's day of judgment. We expect, then, that the Revelation of Jesus Christ to John on the Lord's Day is a revelation of God's judgment, which, we will find, will prove to be the case as we go deeper into the book of Revelation. 13 And in the midst of the seven candlesticks one like unto the Son of man, clothed with a garment down to the foot, and girt about the paps with a golden girdle . Thus, we have found that the great voice that John heard behind him is the voice of the Son of man who we know is Jesus Christ, and His voice is said to be as a trumpet because His voice is distinct, sharp, crisp, and loud. Here, we find that the great voice which John heard behind him, which we already learned is the voice of Jesus Christ, first said, I am Alpha and Omega, the first and the last. Since Alpha and Omega are the first and last letters of the Greek alphabet, and the alphabet exists for a language to describe everything, we are being told that Christ is the first and last of everything. For Christ to be the first of everything means that He existed before everything else. And, for Him to have existed first before everything else means that He must be eternal God without a beginning and the creator of everything else because nothing else existed to be eternal God and the creator before He existed. Furthermore, for Christ to be the last of everything means that He exists after everything else. And, for Him to exist after everything else means that He exists after everything else is gone, which means He must be the eternal God without an end and the destroyer of everything because nothing can exist longer than Him, for He is the last to exist of everything else. So, for Christ to be the first and last of everything means that He must be the creator as well as the destroyer, and eternal God without a beginning or an end. But, next, eternal God, namely Jesus Christ, says to John, What thou seest, write in a book, and send it unto the seven churches which are in Asia; unto Ephesus, and unto Smyrna, and unto Pergamos, and unto Thyatira, and unto Sardis, and unto Philadelphia, and unto Laodicea. Hence, John was commanded to write in a book (literally, a scroll) what he was seeing in his revelation of Jesus Christ, and he was to send it to the seven churches of Asia (see map ). But, this did not mean that John's message was just for the literal seven churches in Asia, for the literal seven churches symbolize the totality of all churches that would ever come into being during the Church Age because the number seven symbolizes totality (see Bible Number 7 ). So, although John may have thought that he was just writing to the literal seven churches in Asia, God was writing through him to all the churches that would ever come into being throughout the Church Age from May 21, 33 AD to May 21, 1988 (see Biblical Timeline ). In other words, what God says through John to the seven churches of Asia, he is also saying to all the churches throughout the New Testament period. Its like pulling back the curtain to see what God says about all his churches that ever existed throughout the Church Age as He writes to the seven literal churches of Asia. 12 And I turned to see the voice that spoke with me. And being turned, I saw seven golden candlesticks . . . In this verse, John turned to see the voice that spoke with him, and being turned, he says, I saw seven golden candlesticks. These seven golden candlesticks remind us of the six-branched candlestick which was a part of the Holy Place in the tabernacle that the Israelites built according to the instructions that Moses received from God. You can view a picture of this candlestick and its position in the tabernacle below in the picture. Notice that this candlestick holds not only one candle, but because it has three branches which come from each side of the one candlestick, it can be said to have a total of seven candlesticks. Are these the seven candlesticks that John saw in his vision? Or, did he simply see seven separate or unattached candlesticks? Whatever the case, the important thing here is that he saw seven golden candlesticks. 20 The mystery of the seven stars which thou sawest in my right hand, and the seven golden candlesticks. The seven stars are the angels of the seven churches: and the seven candlesticks which thou sawest are the seven churches . So, when we are told that John turned to see where the great voice as a trumpet was coming from, and he turned and saw seven golden candlesticks, we are being told that he saw the seven churches of Asia. And, since we already learned that the seven churches of Asia represent the totality of churches that would ever come into being during the Church Age (see Bible Number 7 ), we can say that John saw a picture or type of all the churches that would ever arise in the New Testament period until the Church Age came to an end on May 21, 1988. Now, returning to our verse, this Jesus who is in the midst of all the churches is, we read, clothed with a garment down to the foot, and girt about the paps with a golden girdle. What does this tell us about Jesus Christ? 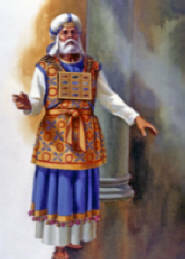 Well, when we search the Bible for anyone who wore a similar type of clothing, we can only come to one conclusion, namely that it was the clothing of the High Priest, which is illustrated below in the picture. Isa 11:5 And righteousness shall be the girdle of his loins, and faithfulness the girdle of his reins . Furthermore, because Christ in our verse is pictured wearing High Priest clothing, we are being taught, of course, that Christ is our High Priest in heaven. He has overcome Satan, sin, and death, and He is now in heaven to intercede for us forevermore, amen. 14 His head and [his] hairs [were] white like wool, as white as snow; and his eyes [were] as a flame of fire . . . In this verse, we first read, His head and his hairs were white like wool, as white as snow. Wool is what covers sheep and protects or saves them from the harsh environment. We could say, the wool is their clothing of salvation. And, since sheep in the Bible are a picture of the elect, we can say that wool is what saves or covers the elect from their nakedness or sins. It is the elect's clothing of salvation. And, what is the elect's clothing of salvation? Why, it is the Lord Jesus Christ Himself. Therefore, when our verse says that His head and His hairs were like wool, it means that His head and His hairs were like Jesus Christ, our Savior. Obviously, for your sins to be made white as snow means that you have been purified from your sins and made holy, and, for your sins to be made as wool means you have been saved from your sins by Jesus Christ who is the covering (the wool) or salvation of the sheep, namely the salvation of the elect who are pictured as sheep. 1Co 11:3 But I would have you know, that the head of every man is Christ; and the head of the woman is the man; and the head of Christ is God . Therefore, the head of Christ is God so that when we read that His head and His hair were white like wool, as white as snow; that is, they were pure and holy like Jesus Christ, we are being told that His head and hairs (God) were pure and holy like Jesus Christ. So, in our verse, we are simply being taught that God, the head and hairs of Jesus Christ, is pure and holy like Jesus Christ, and this makes perfect sense when we realize that God is Jesus Christ as we have already learned in our last study (see Revelation 1:8 ; also God is a Trinity ). Joh 12:48 He that rejecteth me, and receiveth not my words [receives not my words unto obedience], hath one that judgeth him: the word that I have spoken, the same shall judge him in the last day . And, since we have been in the last day ever since May 21, 2011, all who have rejected Christ and His Word are being spiritually judged right now by no possibility of their ever being eternally saved. Yet, there is a completion of this judgment yet to come on the Last Day of Judgment Day as well. This will be when the judgment which began on May 21, 2011 will be made outwardly manifest to everyone. Joh 3:36 He that believeth on the Son hath everlasting life: and he that believeth not the Son shall not see life; but the wrath of God abideth on him . Ro 1:18 For the wrath of God is revealed from heaven against all ungodliness and unrighteousness of men, who hold the truth in unrighteousness . . . Yes, the eyes of Christ are as flames of fire because He is the judge, and He brings His judgment or wrath against the sinners, against all who have not been born anew into the Spirit of righteousness through the faith of Jesus Christ, which was only granted to the elect who were predestined unto eternal salvation from the foundation of the world, and who were all eternally saved by May 21, 2011 when any possibility of anyone else being eternally saved came to an end, and the spiritual wrath of God and Judgment Day began (see " Is God Still Saving? " and Luke 11:5-13 , Isaiah 13:10, scroll down to verse 10 and Isaiah 13:14 and Revelation 18 study - Part 3, scroll to verses 21-23 and Revelation 9 - Part 2, verse 6 and Jeremiah 50, scroll down to verse 12 and Jeremiah 50:16-17 , Jeremiah 50:40 , Jeremiah 51:26 , Jeremiah 51:30 and 32 , Jeremiah 51:36 , Jeremiah 51:43-44 , Jeremiah 51:55 , Jeremiah 51:58 ). 4 He [Jesus] riseth from supper, and laid aside his garments; and took a towel, and girded himself . 5 After that he poureth water into a bason, and began to wash the disciples' feet, and to wipe them with the towel wherewith he was girded . 6 Then cometh he to Simon Peter: and Peter saith unto him, Lord, dost thou wash my feet ? 7 Jesus answered and said unto him, What I do thou knowest not now; but thou shalt know hereafter . 8 Peter saith unto him, Thou shalt never wash my feet. Jesus answered him, If I wash thee not, thou hast no part with me . 9 Simon Peter saith unto him, Lord, not my feet only, but also my hands and my head . 10 Jesus saith to him, He that is washed needeth not save to wash his feet, but is clean every whit: and ye are clean, but not all . In other words, Jesus said to Peter that he that is washed has no need but to wash his feet. This is because the feet represent the whole person so that it is only the feet that need be washed, which symbolizes the washing away of sin from the whole person. So, when Jesus says to Peter that only the feet need be washed and not the whole body, it is because the feet represent the whole person so that to wash the whole person, one need only to wash the feet. Now, returning to our verse and applying what we have learned about the feet, when our verse says, And His feet like unto fine brass, as if they burned in a furnace, it means His whole person was like unto fine brass as if it were burned in a furnace because His feet represent His whole person. But, now, why are we being told that His whole person, symbolized by His feet, is like unto fine brass as if He burned in a furnace? In reply, we must recognize that His whole person, symbolized by His feet, is said to be like fine brass because fine brass is brass that has had all the impurities melted away from it in a furnace to produce the end-product of not just brass, but fine brass. And, this fine brass is a picture of the whole person of Jesus Christ who had all the impurities of the elect's sin that He bore in His body on the cross melted away by His having paid the price for their sins by coming under the wrath or fire of God for them in the fiery furnace of hell. So, His whole person, symbolized by His feet, is said to be like unto fine brass as if [He] burned in a furnace because this is painting a picture of what Christ did for His elect by being cast into hell (the furnace) on the cross and coming out the other end like fine brass being purified from the sins of His elect which He bore in His own body for them when He died on the cross. Ps 18:16 He sent from above, he took me, he drew me out of many waters . 2Sa 22:17 He sent from above, he took me; he drew me out of many waters . . .
1 And there came one of the seven angels which had the seven vials, and talked with me, saying unto me, Come hither; I will shew unto thee the judgment of the great whore that sitteth upon many waters . . .
15 And he saith unto me, The waters which thou sawest, where the whore sitteth, are peoples, and multitudes, and nations, and tongues . Thus, we see that many waters can symbolize all the unsaved peoples of the world on which the great whore sits (rules over) as well as symbolize hell and death so that the voice of Christ is as many waters means His voice brings the damnation of hell and death to the peoples, and multitudes, and nations, and tongues; that is, His voice, which is in the midst of all the churches, brings the damnation of hell and death to all the unsaved peoples of the world. We first found that the apostle John was in the Spirit on the Lord's day. This meant that John was especially in tune to his saved spiritual nature in Christ rather than his unsaved fleshly nature, and, thus, in a state to be able to see and hear the revelation of Jesus Christ. John is said to be on the Lord's Day because the Lord's Day is representative of Judgment Day when the wrath and judgment of God takes place. So, in that John is in the Spirit on the Lord's Day is as if John were brought into Judgment Day to be able to see the future judgments and wrath of God. Then, we learned that John heard a great voice behind him, as of a trumpet, and we learned that this great voice was the voice of the Lord Jesus Christ who said to John, I am the Alpha and Omega, the first and the last, which, we learned, means that Jesus is eternal God without beginning, and without end. And, because Jesus is the first and last of all things, He must also be both the creator and the destroyer of all things. Furthermore, this great voice that John heard, which we learned to be the voice of Jesus Christ, told John to write in a scroll what he sees in the revelation of Jesus Christ, and to send it to the seven churches of Asia. The seven churches of Asia, we learned, symbolize all churches that would ever arise during the Church Age from May 21, 33 AD to May 21, 1988. Next, we learned that John said, I turned to see the voice that spoke with me. And, being turned, I saw seven golden candlesticks; and in the midst of the seven candlesticks one like unto the Son of man, clothed with a garment to the foot, and girt about the paps with a golden girdle. In these verses, we learned that the seven golden candlesticks symbolize the seven churches, and the seven churches symbolize all the churches that would ever arise. So, when John saw one like unto the Son of man in the midst of the seven golden candlesticks, He saw Jesus Christ in the midst of all the Christian churches that would ever come into being. And, in that Jesus Christ was clothed with a garment to the foot and girt about the paps with a golden girdle means that Jesus is the High Priest of all the churches. The garment to the foot represents the covering for the sins or nakedness of the elect, Christ's body, and the golden girdle represents the righteousness and faithfulness of Jesus Christ. Finally, we learned that Christ's head and [his] hairs [were] white like wool, as white as snow; and his eyes [were] as a flame of fire; and his feet like unto fine brass, as if they burned in a furnace; and his voice as the sound of many waters. In that Christ's head and hairs were white like wool, as white as snow means that God (symbolized by His head and hairs) is like Jesus Christ (symbolized by the word, wool), pure and holy (symbolized by the phrase, white as snow), and, in that His eyes were as a flame of fire means that He is the judge; He renders judgment to all things that He sees in the midst of all the churches. Furthermore, that His feet like unto fine brass, as if they burned in a furnace means that His whole person (symbolized by His feet) has been brought through the furnace of the cross to be purified from the sins of the elect which He bore in His body to pay for their sins. And, that His voice as the sound of many waters means that Christ's voice is damnation to hell and death for all the unsaved of the world.